Precisely a month from today – on 5th June – we will be celebrating World Environment Day (WED). Undeniably, WED is the most prominent global environmental event celebrated annually. The theme for WED 2013 is ‘Think.Eat.Save.’ This theme seeks to turn the spotlight on food wastage, which is estimated to be approximately 1.3 billion tonnes a year. Further, ‘Think.Eat.Save.’ is also an invitation to reflect on the environmental impact of the food choices we make. I guess this theme – centred on the issue of food – sets the stage for the International Year of Family Farming (IYFF-2014). The IYFF, with its catchy slogan, ‘Feeding the World, Caring for the Earth’, aims at promoting family and community based agricultural systems which respect the environment and biodiversity. Considering these upcoming food and farming focused events, our starting work on a ‘Terrace Farm’ at Matunga this morning, seems to be a step in the right direction. 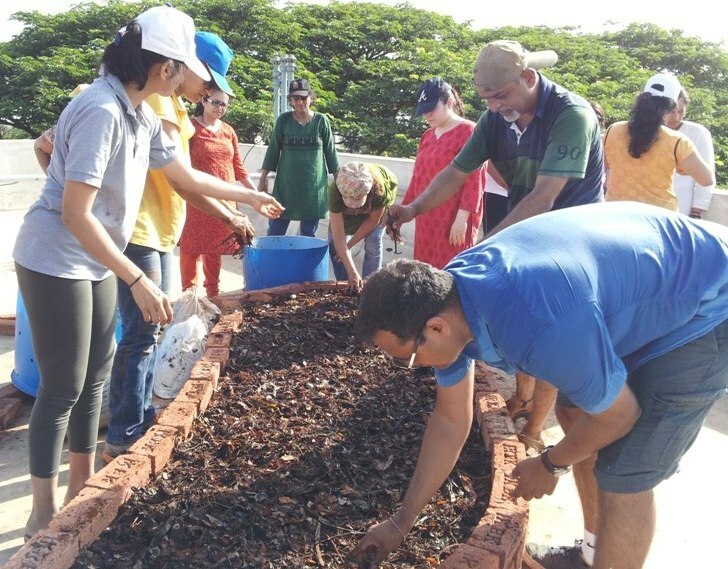 Led by the ever enthusiastic Preeti Patil, of Urban Leaves fame, some two dozen volunteers occupied the morning with laying out bricks, creating beds, filling drums with compost and compostables, planting saplings, fighting the heat, teasing one another, and generally having an enjoyable time! So do these ‘urban farms’ actually produce ‘food’ or are they mere showpieces? Well, they certainly do hand you a crunchy salad or a bowl of fresh fruit periodically, but I doubt they would keep your kitchen going for 365 days of the year. So what purpose do they really serve then? 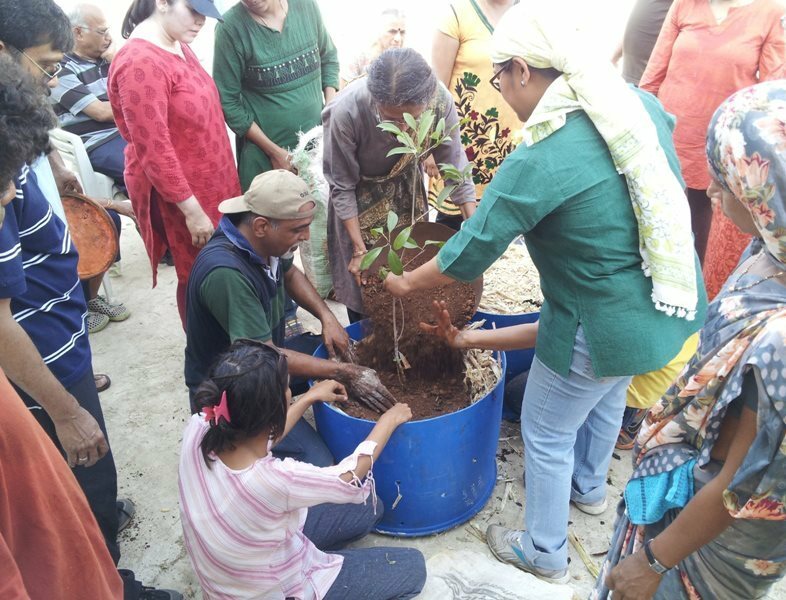 In a city like Mumbai, having a farm on your own terrace, which affords you the opportunity to play around in the soil, to plant and transplant and replant, to watch the seedlings mature into handsome young trees, to smile at the ripening fruit and scream at the crows who lustily devour them... is the ultimate de-stressor. To be able to soak our lives – which have literally turned grey with the soot and the scourge of the city – in our own green pools, well, what could be more rejuvenating? But beyond being a leafy spa, this enterprise has a further value. And that, I believe, is its real value. This messing around with mulch and manure is not only about cultivating food – it’s about cultivating attitudes. Green attitudes. Green culture. Someone who soaks his hands into the soil, or spends hours pottering around her plants, is eventually bound to get interested and involved in all things environmental. So, clearly, this venture is not just about growing green vegetables, it’s about growing green people!